…(and travels over and underground and from Porthmadog to Amalfi all in one day). 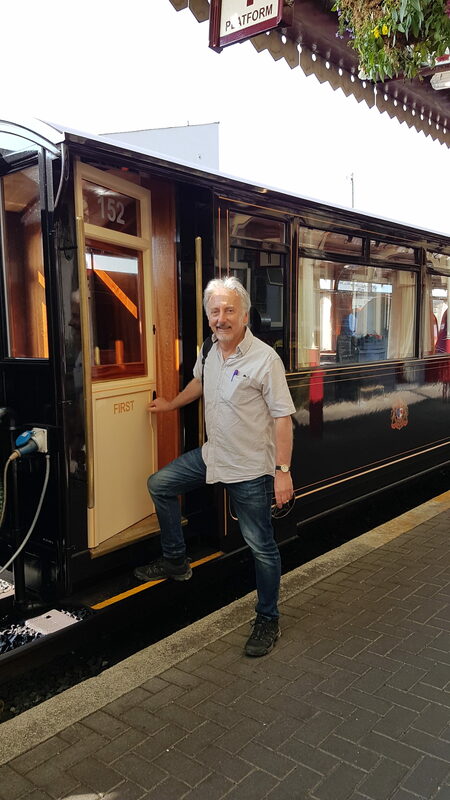 Having heard that the Ffestiniog Railway had started running ‘early bird’ trains on selected Tuesdays, Wednesdays and Thursdays through the summer, I decided this week to try out this service and as a result had a really great day enjoying the delights of Snowdonia. The two things that initially attracted me to the service were the fact that it enabled me to see some of the region’s great visitor attractions without using my car and secondly it helps me make the most of these long (and hopefully sunny) summer days. My day started at 8.30am at Porthmadog Harbour Station when I boarded the 8.40 FR train, which for this first departure of the day, was being pulled by two magnificent Hunslet locomotives called Linda and Blanche. 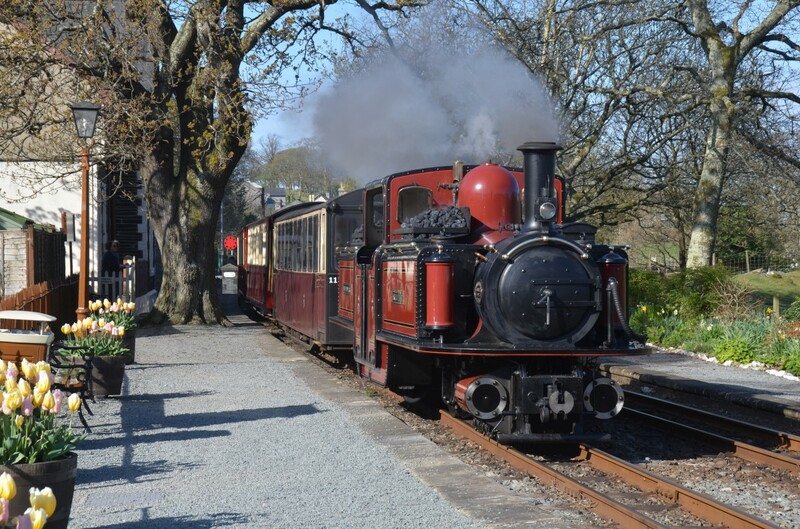 2018 is a very special year for these two former Penrhyn Quarry ‘Ladies’, as they were both built in 1893 and will be celebrating their 125th birthdays over the weekend of 23rd June. My destination was Blaenau Ffestiniog, but as we crossed the mile-long sea wall known as The Cob, we could easily have been travelling the Sorrento Peninsula such was the vibrancy of the azure-coloured sea reflecting the cloudless skies above Tremadog Bay. I had booked a continental breakfast in advance and within minutes of boarding it was served at my seat by steward Karen, beaming from ear to ear as she proudly announced that Porthmadog had been the hottest place in Britain the day before. Fresh orange juice, granola bar, yoghurt, croissant and jam, all for just £5.00. Soon we had left the coast and were travelling deep into the National Park, lakes, rivers, waterfalls and mountains shimmering in the early morning sunshine. My fellow passengers included a booted couple carrying hiking poles and rucksacks, destined for a day’s walking in and above the beautiful valley of Cwmorthin (easily accessed from Tanygrisiau Station) and a photographer looking for the perfect shot for a Snowdonia Society photographic competition. As our train approached Blaenau Ffestiniog I could see the normally grey slopes of waste slate were alive with colour. 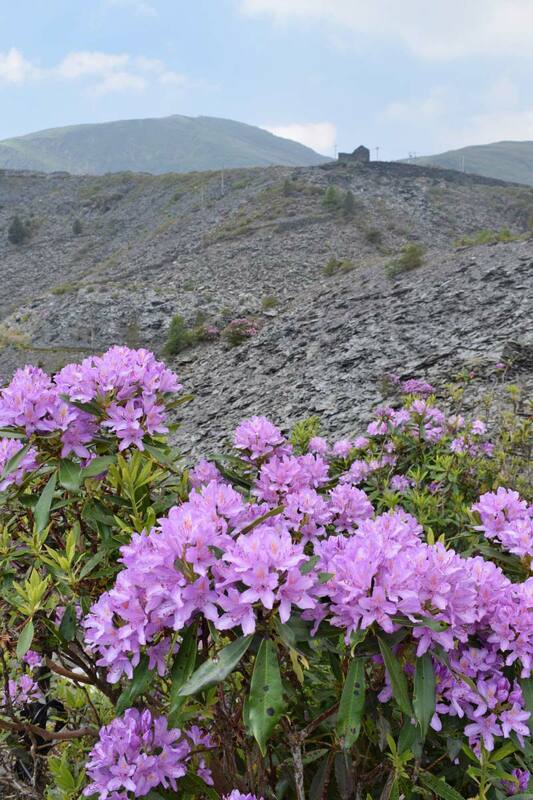 Now I know perfectly well that Rhododendron ponticum is an invasive thug worthy of eradication, but you cannot help but have a secret admiration for the way it is able to colonise places that no other plant can – such as the waste slate heaps around Blaenau and for a few weeks each year turn a grey world into lilac-pink with its beautiful flowers. We arrived at the station dead on time at 9.50 and by 10.15 I was donning my hard hat ready for a ‘deep mine tour’ of Llechwedd’s slate caverns. Situated just under a mile north of the station, Llechwedd can be reached on foot. However, one of the town’s taxi services “Nev’s Taxis’ is available to run you to and from Llechwedd and the local X19 bus will also stop at the quarry entrance. Llechwedd has undergone a remarkable transformation in recent years, developing a whole series of new and exciting activities for people to enjoy, ranging from over-ground (and underground) zipwires, downhill mountain biking, off-road quarry exploration and even underground giant trampolines! 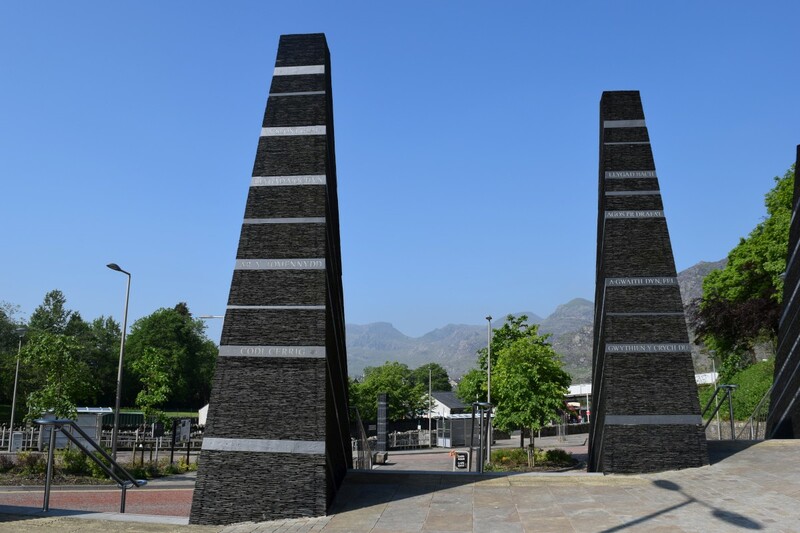 There are those of course who feel the legacy of the slate industry is somehow violated by these new attractions, but as far as I’m concerned it was heartening to see the quarries once again bustling with people of all ages, gender and nationalities. I stopped to listen to a group of young people about to embark on one of the zipwires while their leader described something of the geology, history and the harsh environment that the men who carved out these quarries (and a meagre wage) had to endure. His last words, as they made their way to their ‘launch pad’ were, ‘enjoy it kids, you will be flying through some of the most amazing landscapes in the world’. 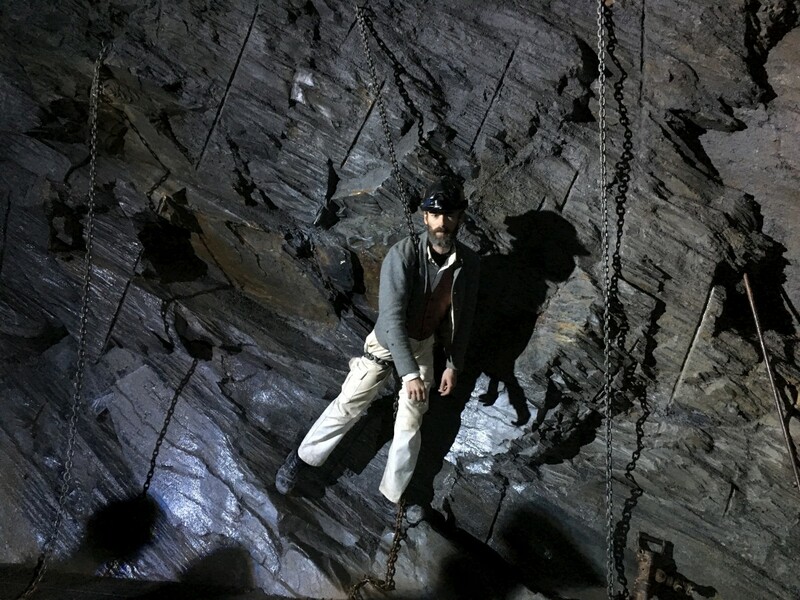 For those, like me (and there were plenty) who weren’t there for some form of adrenaline rush and simply wanted to delve more deeply (excuse the pun) into the history and legacy of this astonishing Victorian industry that ‘roofed the world’, the Deep Mine Tour was perfect. The youngest on my tour was nine, the oldest well over 70 and Jeffrey our guide did a superb job ensuring we all came away with a clear sense of what it must have been like to toil in near darkness 500 feet below the surface with temperatures never above 7 degrees Centigrade and always with the very real chance of injury. Perhaps for me, the most poignant part of our tour was when we stood outside a caban (slate-built shelter where the miners came together for their lunch break) and learnt how they spent this precious half hour out of their long working day. Yes, they ate their bread and cheese, but they also sung, debated and provided education to their younger colleagues, some of whom were only eight years old. After more than an hour in this fascinating Victorian subterranean world I was ready to reach the surface and feel the warmth of the sun on my face whilst I ate my lunch – a delicious ham and cheese salad made with Llechwedd’s very own Cavern Aged Cheddar. Lunch over, it was time to watch a slate splitting demonstration (now there’s a skill if ever I saw one) and then a browse in the shop alongside, which was doing a brisk trade in beautiful hand-crafted slate products ranging from wine racks to house name signs, before making my way back to the station, where I caught the 13.40 train down the Ffestiniog line to Minffordd. I had been told by the helpful staff in the Porthmadog Harbour Station booking office that the Italianate village of Portmeirion was a twenty-minute stroll from Minffordd Station and it was, but what they hadn’t told me was how pleasant that stroll would be, because most of the walk was along Portmeirion’s leafy driveway, shaded by centuries-old oaks and chestnuts with occasional glimpses out to the Dwyryd estuary and across the bay to Harlech Castle. Portmeirion attracts over 200,000 visitors every year and the streets of the village were bustling with people, but that, along with the cloudless skies, just added to the sense that I was no longer on the beautiful Welsh coast but in the equally beautiful Italian coastal town of Amalfi! All around me tower bells slowly tolled the hour and swallows sped past the grand Pantheon Dome before diving down between clusters of brightly coloured buildings that hugged the sea cliffs. Designed by architect Sir Clough Williams-Ellis over a 50-year period from 1925 until 1975, Portmeirion is well-known as the setting for the cult 1960s TV series ‘The Prisoner’. 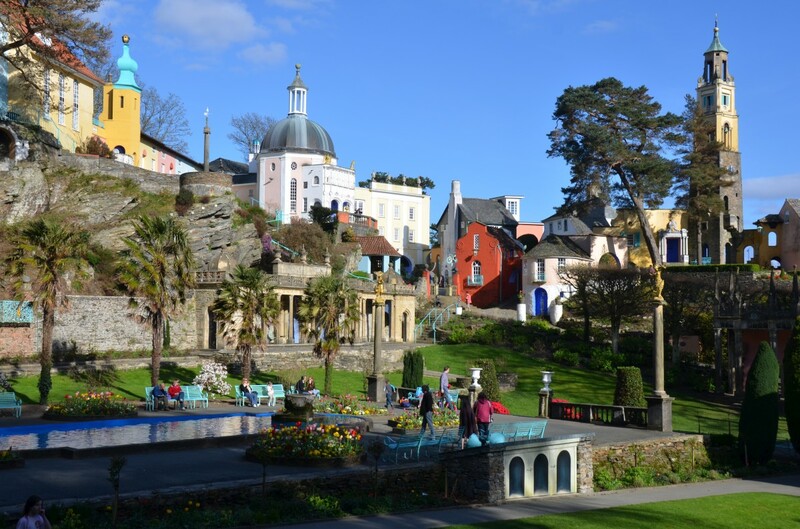 It is also the place of origin for Portmeirion pottery and more recently, has become the venue for a music and arts festival known simply as ‘Number 6’. However, what isn’t widely appreciated is that Portmeirion has one of the most unique and diverse collections of plants in Wales. With that in mind I made my way through the village, pausing only for a quick cup of tea in the town hall, and into the 70-acre (28-hectare) woodland called Y Gwyllt which lies beyond. Here, concealed from view was a magical secret valley containing lakes, oriental follies and bridges, gigantic rhododendrons and dense mature vegetation reminiscent of the Nepalese foothills of the Himalayas. Following paths at will (some it must be said extremely overgrown) I eventually emerged onto a headland, where magnificent westerly views opened out across Tremadog Bay to The Cob, with Porthmadog and the Ffestiniog Railway’s Harbour Station at its furthest end. This was the prompt I needed to remind me that my return train from Minffordd Station would be leaving at 18.15. As I strolled back to the station I reflected on my day. Breakfast on board that beautiful old train pulled by the Penrhyn Ladies Linda and Blanche, a spectacular journey along the coast and through some of the finest mountain scenery in Britain, a fascinating descent into the world of a Victorian slate cavern and the men that worked there. Rich creamy cavern- matured cheese for lunch and then the afternoon experiencing the sights and sounds of the Welsh ‘Amalfi’ and a magical walk through a sub-tropical jungle full of plants that many British gardens could only dream of growing. Wow, what a day! And all achieved thanks to the early bird service now offered by the Ffestiniog Railway.